If I start a post with a list, it probably means I couldn't come up with an intro. these oreo cheesecake cookies are the bomb diggity. I mentioned to you all that some of the recipes from my original wordpress blog would make their way over here, and these cookies will be the first of them. These have been a favorite for the past five-ish years, because they're chewy, soft, and loaded with oreos. I guess the only "cheesecake" part of this recipe is the cream cheese that's thrown in, and that's fine with me. baker's notes: these cookies double and freeze well. 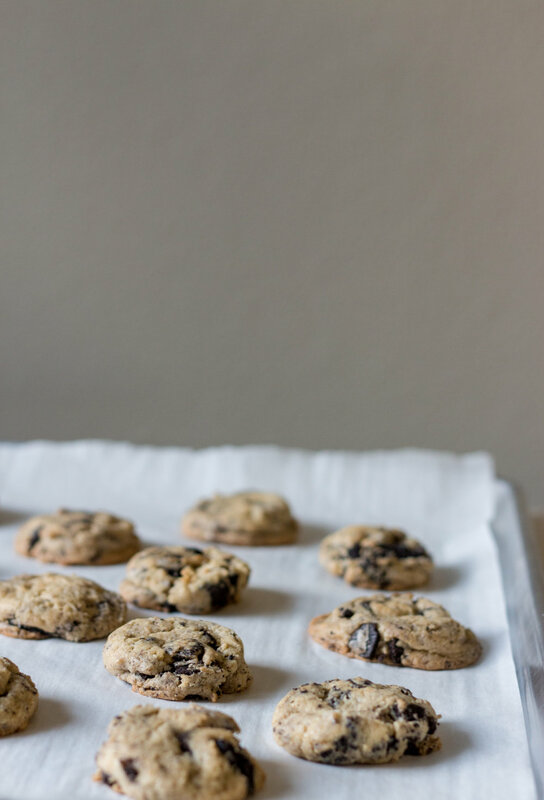 Doubling the batch is helpful because you'll also end up using the entire standard package of oreos, and freezing is helpful because you'll likely have many cookies if you double. 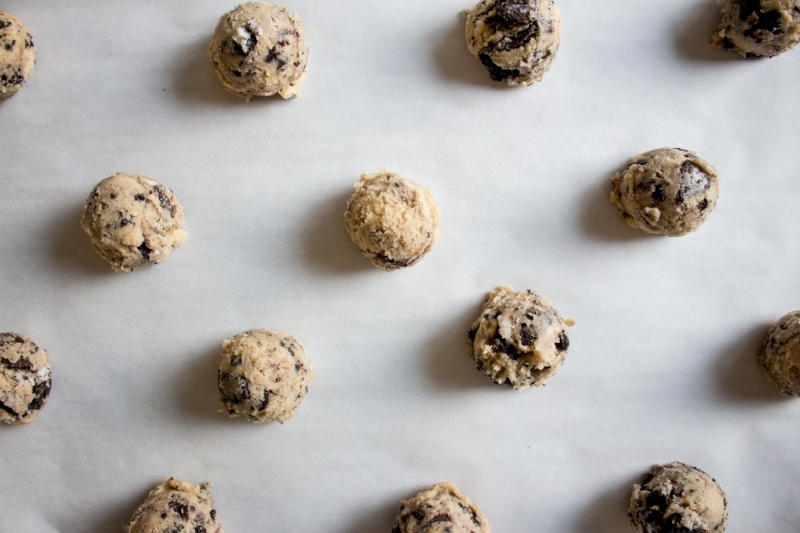 if you freeze, make the recipe until you roll the cookie dough into balls. place on a cookie sheet (i usually line mine with plastic wrap for easy clean up), freeze until solid, and place in ziplock bags. when you want to bake them, place the frozen cookie dough balls and bake for about 11-15 minutes, or until the edges are lightly browned. you'll want to use full-fat cream cheese for this recipe, since you're replacing some of the butter with cream cheese. if you're cutting from an 8-oz block, you'll end up with leftovers for sure, but they're perfect for cream cheese frosting, mini cheesecakes, and other cream cheese cookies! google is your friend here. also, note that the recipe instructs you to chill the dough. now, if you don't have the time, it should be fine, but chilling the dough produces a thicker and chewier cookie. i also hate scooping chilled cookie dough (and have broken at least three cookie scoops in the process), so i usually scoop dough balls, then chill. this also helps if you plan on freezing extra cookie dough balls! In a large bowl, cream together the butter, cream cheese, brown sugar, and granulated sugar until fluffy. Mix in the egg and vanilla. Add the flour and baking soda, and stir until a dough forms. Fold in the crushed oreos. Chill the dough for at least an hour, or up to 3 days in the fridge, tightly covered. And note, I think this part is worth it, since chilling the dough makes the cookies thick and chewy. but if you really don't have the time, skipping is ok, but keep in mind that you may not yield the same results. preheat oven to 350 f. scoop 1.5 tablespoons of dough for each cookie (or more or less, depending how large you want your cookies to be). Place dough balls onto a lined baking sheet lined with parchment paper or a silpat. bake the cookies for 8-12 minutes, or until the edges are slightly browned. the centers will be soft and puffy, but will firm up a bit as they cool. the cookies will keep at room temp for up to a week, if they stay around that long.